You have to pay 25 for parking not cool especially given that it’s in a very popular neighborhood. Excellent breakfast area and great staff attending to it. Rooms could be wiped down better. Something crusty on desk/Tv area. Trash can was dented up like someone kicked it. Not all electric outlets worked. Hallways were dirty could use a good wipe down. Smears all over stainless steel wall area. Nice room. Courteous and helpful staff. Parking is limited or pay $25 for valet. Nice hotel. Right next door to shopping center. No on site parking except for valet which is $25/day. Too much for me to pay so i always had to find parking on the street usually in front of someone's house a block or two away from the hotel. We always have a pleasant experience here. The location and the price is good. The only negative is the rooms are smalls and the length of beds are so short. I’m only 5’3 and my feet can touch the end of the bed. Great location with full breakfast. People very nice. I will be back! Bathroom was disgusting leftover hair in the drain . Mold on the sliding rail. Room very cold no matter how high I put the heat on . Small rooms, hard to navigate around the bed. Very comfy bed thought. I asked 5xs from 12p to 10p for room service. I had to make my own bed after retrieving clean linen from the maid cart in the hallway. I had to also ask for towels at the front desk. Maid service unacceptable!! 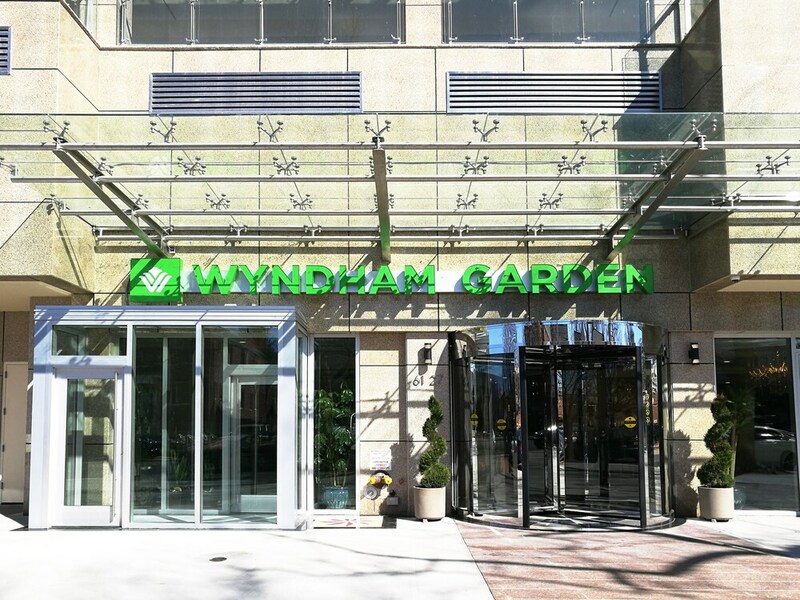 Located in Queens, Wyndham Garden Fresh Meadows Flushing is 1.6 mi (2.6 km) from St. John's University and within a 10-minute drive of other popular attractions like Flushing Meadows-Corona Park. This 150-room, 3.5-star hotel welcomes guests with free breakfast, a 24-hour fitness center, and free in-room WiFi. Free hot/cold buffet breakfast is served each morning from 7:00 AM to 10 AM. Guests can expect to find free WiFi and 40-inch a flat-screen TV with cable channels. The pillowtop bed provides a full night's sleep and the bathroom offers hair dryers. Other standard amenities include a refrigerator, a coffee maker, and free local calls. Guests of Wyndham Garden Fresh Meadows Flushing enjoy a 24-hour fitness center, free WiFi in public areas, and a conference center. Valet parking is available for USD 25 per day. Multilingual staff at the 24-hour front desk can assist with securing valuables, tours or tickets, and luggage storage. Additional amenities include a microwave in a common area, a computer station, and express check-in. Thank you for your positive review. We are looking forward to see you again. Thank you for your support, looking forward to see you again. We're sorry you didn't have a great experience. Our hotel is always trying to improve our experience for guests. We will forward this to our management. Free hot/cold buffet breakfast is served daily from 7:00 AM to 10 AM. Recreation features at Wyndham Garden Fresh Meadows Flushing include a 24-hour fitness center. No alcohol is served at Wyndham Garden Fresh Meadows Flushing.